If you're in the habit of complaining about how quickly your smartphone battery runs down, be thankful that you can charge it from virtually anywhere and retain your connection to things all over the world. And for a cost that doesn't make any noticeable impact on your electricity bill. Back in the 1950s when I was growing up in Kilcullen, we had full mains electricity. But outside the town there were many families who still depended on paraffin for light and wet batteries to keep their radios going. Some farms had electric light before the arrival of the rural electrification scheme, but also depended on banks of the wet batteries. 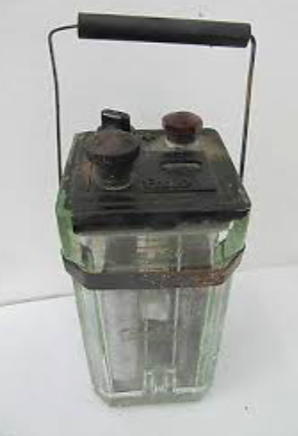 These batteries were made of heavy glass, with lead plates and sulphuric acid inside which, with connection from the red and black terminals on the top, provided power to listen to whatever stations your radio could drag into the system. But a radio which was a lifeline in the winter's darkness. Unlike England, which had enjoyed a rudimentary TV service in some cities during the 1930s, Ireland remained a radio nation until the end of the 1950s. Radio Eireann offered a very limited daily service, and while a number of British and continental stations were notionally accessible on the radio dial, hearing them required more than the standard aerial. Talking to some people who used the wet battery radio then, they rationed their listening, because the battery wouldn't last the week otherwise. Which was an issue when you had to walk in, or cycle with the device and probably also with the can for the week's paraffin requirement. In my home growing up, we didn't have those issues. We had the electricity because we were in a town where it had been available readily for some years. I have previously documented the programmes which I listened to while growing up, so we'll not go there again. But today, like anyone reading this, I'm able to listen to radio from all over the world on my phone, on my iPad, on my various computers, even streaming from my TV if I want. And that's not including the increasingly ageing technology of ordinary radios which are in almost every room in a modern home. The powering of the various devices which are used to access all this depends on what they are. Anything plugged into the mains isn't an issue. But neither, much, is it for those which depend on regular, often daily, plugging into low-voltage USB chargers which are available in our homes, on our computers, in our cars, and as rechargeable external power sources. Even my local pub provides a free recharge service for its customers' phones. OK, our smartphones, if we use them to their extraordinary limits, tend to run out of juice quickly enough. But, unlike an 84-year-old friend whom I've just been talking to about the 'good old days', we never have to cycle three miles each week, the glass battery on one handlebar, the paraffin can on the other, to both bring home light and be 'online'. Let's hope that in what looks like could be an extraordinarily volatile 2017, we're not dragged into a nuked world where we're brought back to depending on smoke signals. Then, we'd really have reason to complain.